This year, we take a moment to reflect on the strength of our Mums, who got us to where we are today, whom we shall forever have a timeless and ageless bond with. We share with you Mothers who inspire us, their stories and what being a Mum means to them and their constantly busy and changing lifestyles. I remember the first time I met Rowie, sitting peacefully in her workroom while her little boy Bohdie clung to various members of the team hopping between their seats like it was a fun filled game of excited. Calm & collected, Rowie was the perfect example of a naturally beautiful, working Mum. Rowie has climbed to success within our stores in a short time with her understated, simple chic styles, gorgeous prints & colours and choice of natural fabrics. 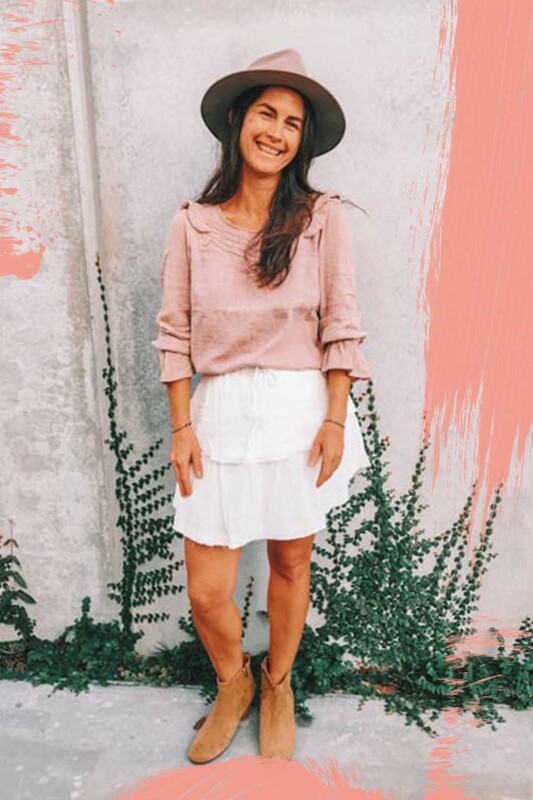 Her history inspires me, her designs and style are perfection and she somehow manages to run a household, a successful brand, and a busy business like it's a walk in the beautiful streets of Byron Bay! Her designs are perfect for the busy Mum on the run, sitting in over half my weekly wardrobe choices for my hectic lifestyle; and although Rowie says her style hasn't changed much except for becoming more practical in her new found role of being a Mum, this practicality certainly shows in her designs. Rowie wears two pieces from our new range in store, the Edie Blouse and the beautiful Kalia Mini. (A firm favourite here in the Tosca & Salome boutiques) I talked to Rowie about her inspirations, being a Mother and how this has impacted on her style today. Kim our beautiful Wicken Goddess. Her smile is infectious, her bond with her brand is absolutely unfathomable. This woman has serious goals in life and she is going places - fast. Talk to Kim about her journey in life and she will tell you, she's exactly where she's meant to be. Her beautiful jewellery line has fast become our favourite here at Tosca & Salome. Featuring meaningful crystals and cuts we love everything she's all about. "My boys are everything to me! They are 21 and 18 years old, and now as a Mum of two young men, it is awesome to see how they have become such gentleman. How they relate to people and the world around them makes me feel so proud and inspired by them everyday. They have ‘bought’ me this fabulous coat which I chose myself from Tosca and Salome, to keep me looking on point and also warm this winter! And I bet they will be super exited to give it to me on Mother’s Day and see how happy and surprised I will be!" Both of these naturally gorgeous women agree, to feel beautiful as a Mum it takes time. Putting aside time for yourself every day whether it's putting your makeup on before the kids wake, or nurturing your inner body confidence to feel beauty radiate from within. Both Mother & Daughter (Jen is Mum to Ses while Ses is Mum to wee Georgina and Olivia) have impeccable style. This super star duo have a sure bond and you can see how the responsibilities of being a role model has been important in bringing up their children respectively. Both are lovers of luxe boho inspired look - aesthetically I am a huge fan of their styling and their photographs which are truly beautiful. I met this fabulous pair in our Takapuna Boutique last Summer, and have been inspired by their story every since. I took a minute to talk to these inspiring women about up and coming Mothers Day issues. Beautiful Jen wears Saint Helena Shirt, while Ses wears Auguste the label tunic both available at Tosca & Salome. I took a minute to talk to these inspiring women about up and coming Mothers Day issues. Do the clothes you wear have an effect on feeling 'beautiful' as a Mum? Ses - Yes they totally do, Buy quality pieces, and items that feel a bit luxe, Everything washes! Wear the glam pieces you love, even if it's just to the park. If you do flats, buy fabulous ones and slip the heels on for a pick me up. Buy casual wear in delicious fabrics, cashmere, merino, organic cotton and always have great accessories. Do you have a Mum style or do you think becoming a Mum has made you more aware of taking time to dress differently? Ses - I think becoming a mum has made me rebell against the standard 'mum' wardrobe. No drop crotch trackies or peek a boo breast feeding tops here. Life is not a dress rehearsal, wear your clothes don't save them for best. I wear pretty or embellished tops paired with ripped denim and heels for dressy or flats for casual; Floaty dresses and tough boots. I love the juxtaposition of mixing dressy and casual together. Jen - Style for me is all about wearing clothes that I love. Fabrics that feel wonderful next to my skin. Age shouldn't dictate style -if I love something I wear it. The most important aspect of being a Mum and a role model to your family - what are these? Why do you think? Ses - Instilling confidence and ability in your kids, that they are clever, creative and beautiful souls. They can really do, and be anything they want to be. Teach them about preciousness. Things are precious and have to be looked after and especially people - they are the most precious of all. Also teach them their body is incredible, so treat it with respect and speak well of it. Jen - Being a Mum is such a responsibility! I believe raising children with great character is so important. To believe in themselves to be kind and considerate to others to believe the best of other - I did this to both my kids. Moments of Freedom - What are your moments of freedom? Is it the way you dress? Is it somewhere you escape in your thoughts of a place you have been? Ses - Sneaking a way for a mani-pedi, getting a quick massage or even just a hot shower (by myself) at the end of a day. Being an influencer doesn't always mean refined dressing, killer heels, with full hair and makeup. Effortlessly beautiful, Aimee from blog @mybelovedstyle talks to us about comfort dressing and sharing her secrets online..
"Being Mother influences the fact that I tend to wear things I can run around in with the kids whilst still wearing the clothes I love. I wear anything from jeans & t's, floaty dresses, hats & big fluffy jackets. I would like to think that my daughters see me express part of my personality & individuality through fashion, having the confidence to wear & put together what I love despite current trends"
Being a Mum Blogger, I always ask my kids before sharing pics or videos of them on Instagram. In regards to my own personal life as a mum, I share a little but not a lot; If there is something I have experienced that I think might help others then I will always share that. This year, I plan to spend Mothers Day with a sleep in & coffee in bed followed by a day out with my husband & girls for lunch & some shopping (If I am lucky!) I will probably be wearing jeans, a comfy knit and leather boots or a floaty dress, denim jacket & tights, I always find it hard to decide what to wear and love winter fashion.